Management of a human-controlled social-ecological system should be based on a set of criteria allowing a compromise between the necessity to conserve the aquatic ecosystem in some predefined “reference” state and the necessity to provide the required ecosystem services such as water supply, a recreational site, and fishery. The task of water resource management can therefore be formulated as the optimization of an objective function (Q) of the economic activities (EA): anthropogenic activities in the lake watershed and intensity of water resources uses, water quality (WQ), and economic effectiveness of the management (costs versus benefits, CB): and assessment of the relationships between them should be a central task for establishing a scientifically based water resource management strategy. In reality, however, we demonstrate the problematic aspects of such an implementation. Kislev, Y. (2010). 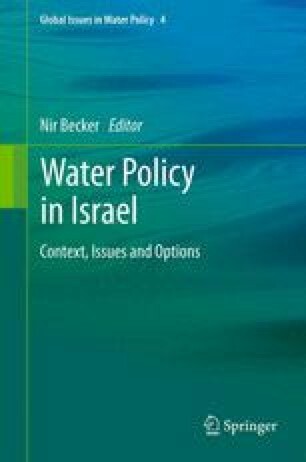 The water economy of Israel. http://taubcenter.org.il/tauborgilwp/wpcontent/uploads/H2011.15WaterEconomyinIsrael.pdf (in Hebrew). Accessed on 25 May 2011. MAP (2011) Management action plan. Open image in new window http://water.gov.il/Hebrew/Planning-and-Development/Planning/MasterPlan/DocLib4/PolicyDocument-jul-2011.pdf. Accessed on 21 May 2012.